As priveleged people, we take a lot of things for granted. Everything from the roof over our heads to, well, the hair on our heads. As a follically blessed human myself I'm just as guilty as the next person when it comes to taking my hair for granted, and it makes me sad that I've only just realised exactly how much of a privelege it is to be able to comb the tangles out of my hair every morning. It sounds silly. Hair is just..it's just that stuff that sprouts from our bodies. But just think for a minute about how much our mood drops if we're having a bad hair day, or if we can't quite make our eyeliner match on both sides. Now think of those people who have - or are still - bravely battling against cancer. 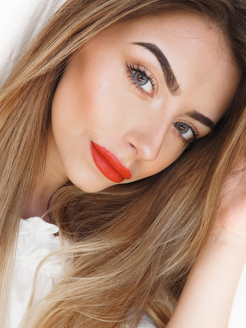 A full head of hair or a flush of colour on the cheeks can make the world of difference to how they feel. I'm a firm believer that when you look good, you feel good. Now I can't and won't speak for anyone suffering with cancer right now, but in my own every day struggles I've found that how you look on the outside really does affect how you feel on the inside. Can a curling wand cure cancer? Probably not, but it can give you that motivation to get up, get out and try again. For today's post I've been given the opportunity by ghd and Look Good Feel Better to create a hair look that makes me feel confident, but more importantly (and hopefully) open your eyes to a cause that's very close to my heart. Studies show that 1 in 3 of us will be affected by cancer at some point in our life, and whilst we can't cure it ourselves first hand, we can do our part. Every week, Look Good Feel Better host workshops for women across the UK to help them combat the physical side effects of cancer. Just in time for Christmas, ghd have launched their limited edition Platinum pink stylers, with £10 of each sale going towards Look Good Feel Better. Safety first ladies and gentlemen! With every style like this I like to make sure I use a good heat protectant to keep my locks in tip top condition. First I brush my hair through and then spray the ghd Heat Protext Spray all over my mane, and then I run my new ghd Platinum Pink Stylers through my hair to make sure there are no crazy kinks. Since we're going for a super voluminous pony today we want to add as much bounce as possible. To do this, grab a small section of hair and curl away from the face. Repeat all around, leave to cool and shake it out! To create a super voluminous ponytail add volume and texture to the hair by spraying the Batiste XXL Volume Spray through the roots. Wait for the product to sink in and massage through to add a bit of oomph to the locks! Want more texture? Of course you do. Apply Batiste's XXL Plumping Powder (can you guess what this stuff does?!) through the crown and the roots and rub in. Then once your hair has doubled in size (literally!) grab your favourite hair band and tie your mane into a loose high ponytail (two wraps of a hair band should do). Next, pull the front sections of your hair down to help frame the face - you don't have to do this, but it does make the look feel a little bit less formal. Next is probably the most important part of this entire tutorial, so brace yourselves. Split your ponytail in half horizontally and wrap the rest of the hair band around the bottom section to help lift the top part of your pony. 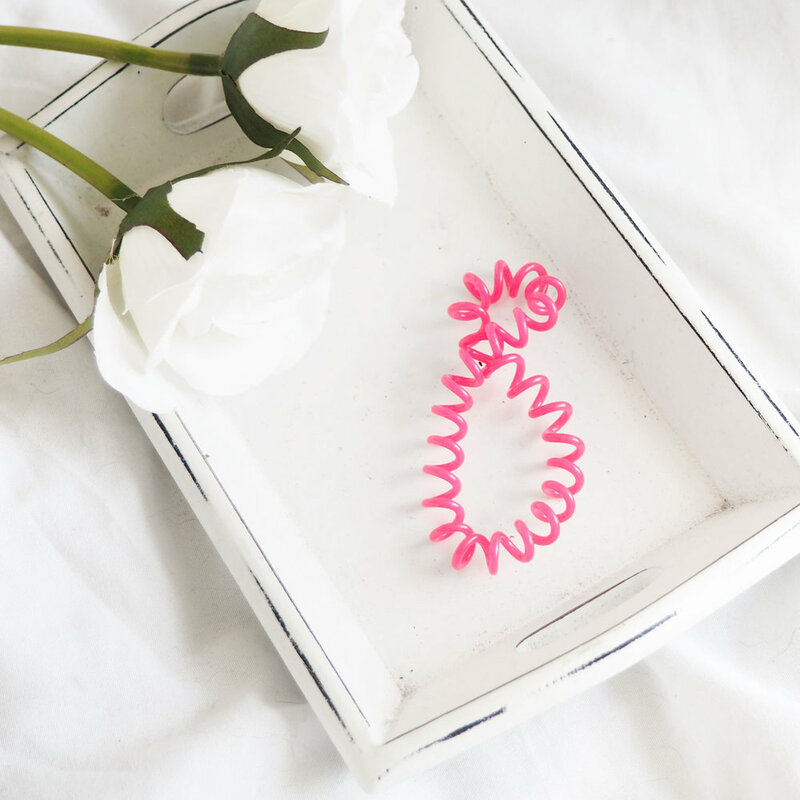 This works best if you have an Invisibobble style hair band but you can do it with just about any hair band you have lying around. Pull both sections tight to add more volume. Once you're happy with the position of your ponytail back brush the underneath of the top ponytail section to add more volume and bounce. Next, flip the top layer back down and smooth over any fly aways using the same back combing bruah (one of my favourites is the one on the right from Technic - and it's cheap as chips). I decided to re-curl a few sections of my ponytail with the ghd Platinum pink styler to give my hair more bounce and add definition to the ends. Pop a bit or hairspray through the hair if you curls have a tendancy to drop a little. Now it's time to neaten up that pony of ours. To do that, take a small section of hair from the bottom of the ponytail, pull it tight and wrap it around the base of your pony to cover up the hairband. Fix it in place using a few bobby pins and voila! What hairband!? Next wrap your front parts of hair around the ghd Platinum pink styler and curl away from the face to frame that pretty little face of yours! Finish by applying Goldwell's Split End Recovery to the ends of the hair and get rid of any pesky fly aways using the Mark Hill Perfecting Polish.